*Different brands of kosher salt yield different volumes, so make sure to double-check which brand you’re using. Click here for a handy guide to measuring kosher salt. And please don’t use table salt–the iodine will turn the pickles icky colors. Wash and trim the ends off the cucumbers. Cut each cucumber into wedges or slices, as you prefer. Distribute the aromatics and spices evenly among the jars–each jar gets 2 garlic cloves, 1/4 tsp crushed red chili flake, 1 tbsp fresh dill OR 1/2 tbsp dried dill, 1/2 tsp peppercorns, and 4 whole allspice berries (if using). Pack the cucumber wedges into the jars on top of the spices–you want them fairly tightly packed, but not so tightly that they get crushed. In a small saucepan, bring vinegar, water and salt to a simmer, stirring until the salt dissolves. Turn off the heat and pour the hot liquid into the jars, leaving about 1/2 inch of headspace at the top of each jar. Discard any excess brine. Tap the jars gently on the countertop to dislodge any air bubbles, then cover them tightly and let them cool to room temperature. Once cooled, transfer the jars to the refrigerator. The pickles will be ready to eat after 48 hours in the fridge. They’ll be fully pickled after about 1 week, and will last in the fridge for about 2 months. Oh man, I need to try those. I love pickles! Can you believe I’ve never had a pickled pepper in my life? Clearly this needs to be fixed. I love pickles so I’ll have to try out this recipe sometime soon! Ooh…I love the pickled cauliflower idea. 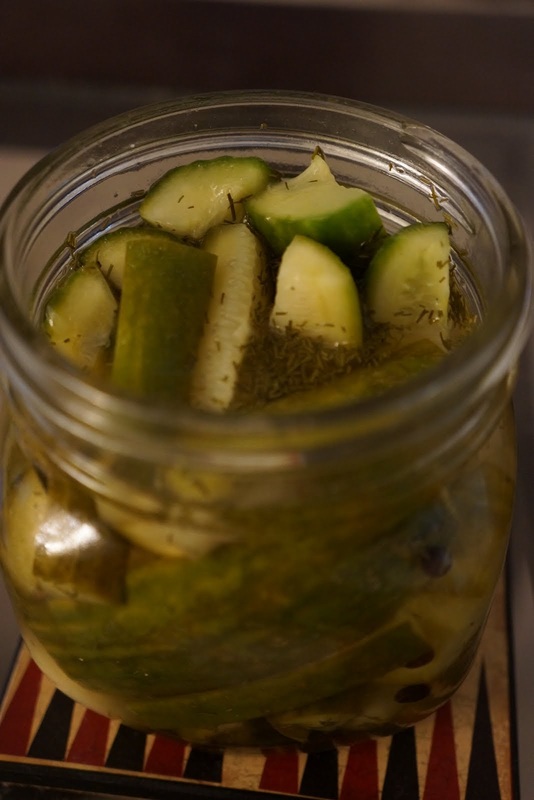 Fair warning: I like my pickles vinegary, so this recipe makes ’em pretty sour–though not unbearably so. Let me know what you think if you try it! Looking at your proportions, I think I used even more vinegar than you have in yours, so I think yous will be better. I have to check the salt proportion and I will definitely let you know as soon as I get another large head of cauliflower – I found that one of those, separated, just about fills a 1.5L jar (and lasts disappointingly not very long at all once made. Even if a bit too sour…).